Summit View - Hot Tub and WiFi. Free 2 hour Bike/Kayak Rental! Summit View - Free 2 hour Bike/Kayak Rental! 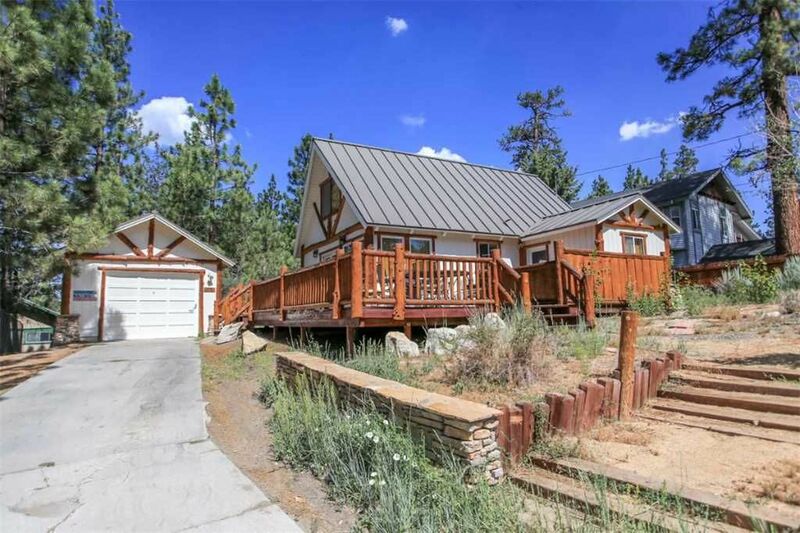 Charming cabin with log accents located in the Fox Farm area close to skiing, mountain biking trails, shopping, and the lake. Large deck and spa plus ski slope and mountain views! Three bedroom, one bath cabin with a hot tub, cable TV, FREE WiFi, cozy living room with new sofa, wood burning stone fireplace, TVs, DVD players, and washer/dryer. Fitted with all the conveniences of home, Summit View has a full kitchen with stove/oven, refrigerator, microwave, blender, toaster, coffee maker, dishes, pots/pans, and more. Summit View comes with fresh towels, and beds are made up with fresh linens and plenty of cozy blankets. Our dedicated cleaning crew has the cabin clean and ready before your visit and does the cleaning after your stay. We appreciate your positive feedback, Robert. We do take pride in catering to our guests’ needs the best way we can. If you’re traveling to our area again soon, don’t hesitate to call us! Wasn't bad, but wasn't great. If you don't have a truck it's going to be hard getting in and out the Steep driveway. The Spa was VERY cloudy and smelly. Yard needed some love. I know were in the mountains, but there were weeds everywhere that could easily be pulled. Nice neighborhood. Dear Scott. I appreciate your positive feedback. We do take pride in catering to our guests’ needs the best way we can. I will be sure to notify our maintenance department of these items. If you’re traveling to our area again soon, don’t hesitate to call us. Friendly customer service, great location close to attraction and shopping centers. Cabin exceeded expectations, will book this property again! Enjoyed our weekend getaway! Hello Fernando. Thank you for taking the time to review your stay with us. I am very pleased to hear that our staff made your stay pleasant. Do checkout our Facebook and Instagram pages for promos that you might be interested in. Looking forward to seeing you again soon. We had a nice stay however had a few concerns. The 4pm check in was very hard, we called several times for early check in and were not greeted very warmly. I understand the policy, however a little warmth would have gone a long way. Outside light was out, and upstairs lamp was not working. Adding a door mat to wipe off the snow would be helpful. The kids had a great time in the back yard though! I would only recommend this house if the price were lowered dramatically. Dear Guest, We're very sorry for the issues you experienced at this property during your stay. Thank you for letting us know so we may improve our service here in the office and make our cabins better for you and other guests. We hope you will return to Big Bear soon and stay with Cool Cabins. Snow to keyed door 7 ft high. Are you kidding me? What if I was elderly or had a bad knee which I do? Jacuzzi advertised as an amenity was covered in 3 feet of snow and ice. That was fun. If you can't handle initial snow removal for arriving renters I don't see how you get any return guests. Driveway was barely plowed. House was dirty and small. And your response is to offer me a 20% discount on another stay. Ridiculous. How about a partial discount.